Like to dance salsa? Haven't tried it yet? Looking for something different to do in Aspen this summer? 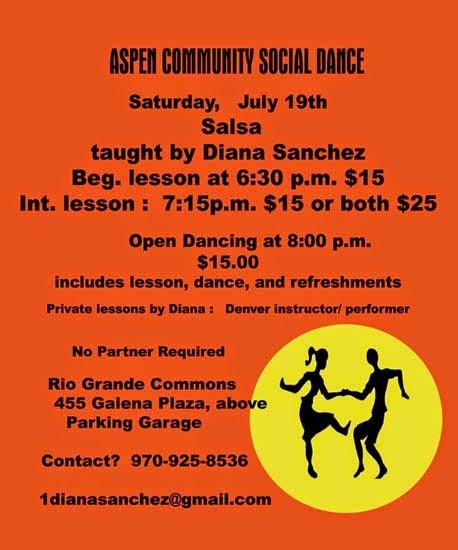 Check out the fun at the next Aspen Community Social Dance - Rio Grande Plaza (above Tasters in Aspen), July 19, 2014. Lessons for beginners start at 6:30pm, followed by an intermediate lesson at 7:15pm and open dancing from 8:00pm - ? For more information, please call 970-925-8536. Lots of fun! Aspen Community Social Dance - Two Too many Two-Steps?